By day 15 we had only 650nm left of our trip. At this stage the forecast was looking good and we maintained a course of 060deg for many days. A slight blow north-west of us developing but would be too far north of us to give us any bother. 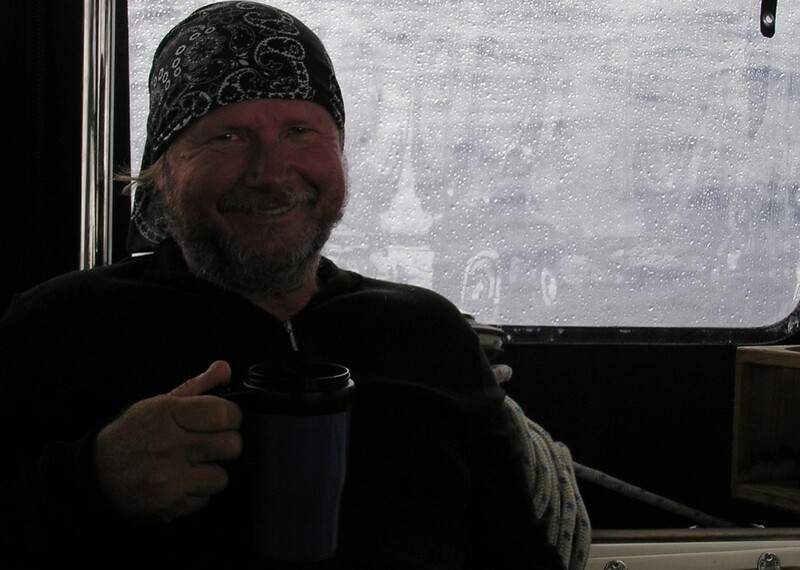 Hi everyone, Skipper and I are having a ball out here in the middle of the North Atlantic! Two weeks have passed and the end is nigh. But really, we’ve had some of the best sailing out here…so far. I’m writing this at 2.30am on a calm night with the spinnaker softly billowing in less than an 8kn southwesterly breeze. A current is making it hard to move faster than 4kn on this still night, but I don’t care. I’m not in a rush to get anywhere. Captain enjoying a hot drink in the comfort of our cosy cockpit. Yesterday was another steady spinnaker day. Beautifully sunny and pleasant sailing, staying on an easterly heading at latitude 32N to avoid strong easterlies northwards of 34N. 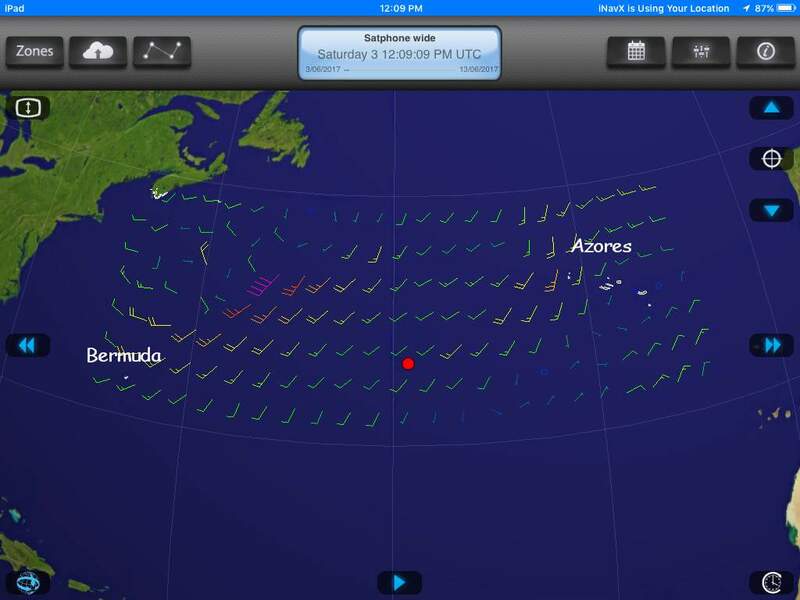 Those winds will eventually shift southerly then westerly so today, with spinnaker still flying, we began a more northerly course to catch those winds and blow us to the Azores. At least, that’s what we are hoping for! Last night the wind was forecast to increase, so before it blew too strongly, we doused spinny and unfurled the sails. Steady southwesterly winds overnight between 16/22kn had us ripping along and surfing down waves. Our best 24 period so far on this trip at 148nm. By early evening the wind eased, and fast moving rain squalls up to 25kn moved in to wash the boat. After an hour, the squalls passed by and the sky cleared. By 9pm, with still an hour of sunlight left, we hoisted spinny again which was supposed to haul us slowly along in the forecast light winds till morning. As it turned out the winds dropped below 6kn and with a downpour about to hit us, we doused spinny and turned on the iron sail. All the clocks on board are now on UTC or Greenwich Mean Time. Azores standard time is UTC-1 but they add an hour during summer (UTC+0). At present location the sun rises at around 7.30am and sets around 10pm. Just about everything we do on board revolves around time – the morning net to chat to other sailors; how many hours off or on watches; sunrise/sunset; how long to cook beans in the pressure cooker to avoid them turning into paste; and the big one – our estimated time of arrival (currently around 9th June). Aside | This entry was posted in 2017, Azores, North Atlantic and tagged North Atlantic, Ocean, passage. Bookmark the permalink.